The mayor of China's southern boom town of Shenzhen, Xu Zongheng, is being questioned as part of a corruption investigation, state media has said. He is the latest official to be caught up in an investigation into Wong Kwong-yu, founder of China's biggest electrical retailer, Gome Appliances. Mr Xu was being questioned for "severe violations", the Xinhua news agency said in a short statement. Chinese corruption investigations may also be part of political in-fighting. "It must have something to do with economic irregularities... but it could also have something to do with a power struggle," an unnamed government source was quoted as saying by the South China Morning Post. 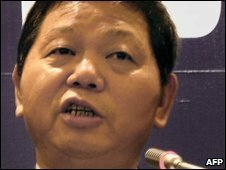 Mr Wong, once ranked as China's richest man, has been under investigation for financial irregularities since last year. Two senior police officials responsible for investigating financial crimes have also been caught up in the scandal. Mr Xu has been put under shuanggui, which is a form of detention imposed on party officials, according to the Post.